This week’s Flashback Friday begins in our office. 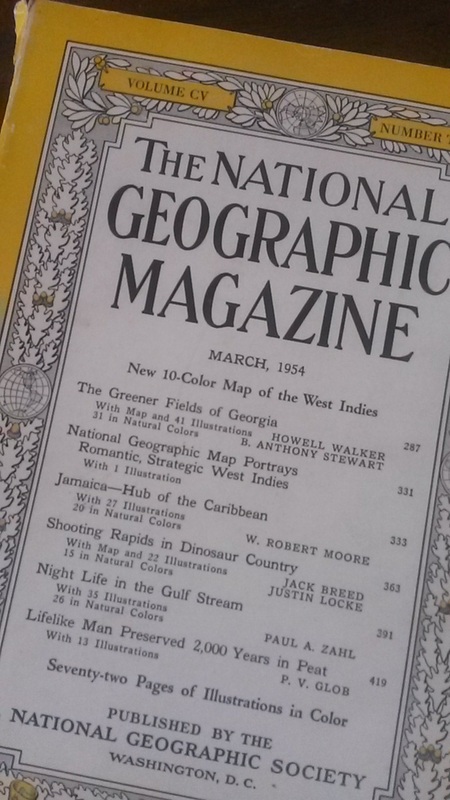 One of our staff, Katy, was cleaning out old magazines and papers from her desk area when she came upon a National Geographic Magazine from March, 1954 featuring an article by Jack Breed and Justin Locke entitled, "Shooting Rapids in Dinosaur Country. "1 I enjoyed the piece’s cheerful and adventurous tone and its tongue-in-cheek references to the place people go to see the dinosaurs 120 million years too late. In the late 1940s, Bus Hatch loved to run rivers, but there was little demand for a commercial rafting company on the Yampa and Green Rivers near Vernal, Utah where he lived. Instead, Bus made his living as a contractor and spent his free time running wooden boats through the rapids.2 However, a confluence of events was about to change all of that. First among these events was the U.S. military selling off their surplus at the end of World War II. Among the items suddenly available for cheap were inflatable rubber life rafts. These rubber rafts were superior to the wooden boats when it came to taking passengers down the river. They could hold more people, required less maintenance and repair, and would bounce off rocks that dealt devastating blows to wooden vessels. Second, at right around this time, plans were moving forward and rapidly gaining public support to build two dams on the Green River, creating a reservoir in the canyon through which it flowed. Media releases in favor of the dam argued that it would actually make the area more accessible as the reservoir would be safe for recreational boaters to use while the river was only able to accommodate reckless daredevils. Despite this, people, including those arguing the dangers of the river, put their trust in Bus Hatch’s skill to get them safely through the winding canyons and roaring rapids. When a dam was proposed on the Green River just below its confluence with the Yampa in the living heart of Dinosaur National Monument in the late 1940s and early 1950s, conservation leaders began taking everyone who would go on float trips, many of them operated by the Hatches, through the spectacular canyons of the Yampa and Green Rivers. 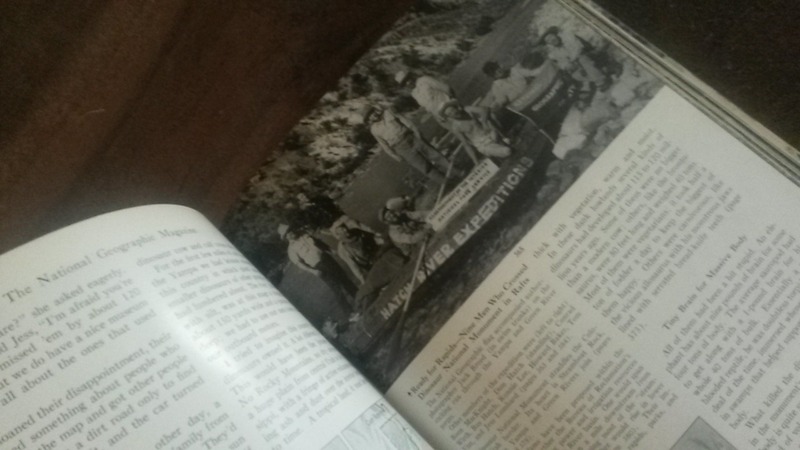 Here, Huser makes reference to the very article that we stumbled upon in the office, lumping it in with "Nationwide news coverage [that] for several years during the controversy helped save the river from the dam and added prestige to river running as a mainstream activity." For the first time, the general public was introduced to the wonders of the canyon of the Yampa, through the beautiful color photographs that National Geographic is so justly famous for. At the same time the anti-dam message was subtly, if forcefully given. Thousands of people read that issue, and wondered if they could possibly try such an adventure. The answer promoted heavily by the anti-dam groups, was of course they could. Though the article’s primary focus was to shine a light on the canyons we would lose if the dam project went forward, it had no small impact on Bus Hatch’s river business. Webb continues, "Thousands of people looked at those wonderful color photographs and saw ‘Hatch River Expeditions’ emblazoned on the sides of the boats. No businessman could ask for better advertising, and free at that." Eventually, public opinion turned against the Echo Park Dam project, and in 1956 it was given up on completely, leaving Bus free to run guests down the river on his safe new rubber boats. He had gone from recreational river runner to full-time commercial outfitter with the demand to keep his family in business for a long time. Long enough that 60 years later, there is an office staff to stumble upon his story. 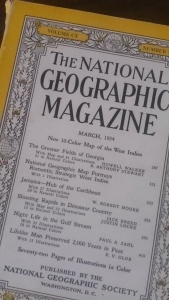 1 – A full copy of "Shooting Rapids in Dinosaur Country" is available in the National Geographic online archives to users who register. 2 – For a more detailed account of Bus Hatch’s life as a river runner, check out Roy Webb’s Riverman: The Story of Bus Hatch available from the Hatch online store. The factual information contained in this post was largely drawn from this book’s fifth chapter "We’ll Lick This Thing Yet: The Echo Park Dam." 3 – River Running: Canoeing, Kayaking, Rowing, Rafting is available for preview on Google Books.